Neil Tocher, CTO at Edinburgh, Scotland-based NCTech, reality imaging systems developer, spoke with GISCafe Voice about NCTech’s recent demonstration of a new 360-degree camera designed to be mounted on any vehicle in order to capture and generate virtual street-level imagery. Google is set to trial the new camera for Street View capture in three countries (not currently announced). Details of the new product were presented at the recent Google Street View Summit 2017 in Tokyo. The California Department of Transportation (DOT) consulting to Caltrans, is using StreetMapper to survey more than 7,000 bridges in California. 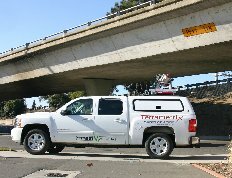 StreetMapper is a mobile mapping system that in this case is being used by survey technology company Terrametrix who was contracted by Caltrans to do the survey.